It’s funny how certain products come full circle. Vinyl records were thought to be a thing of the past, yet sales for the collector’s items are now hotter than ever. Thankfully because of this, videogame music aficionados can get their hands on an array of incredible soundtracks, that now have been beautifully pressed onto polyvinyl chloride discs. From personal experience, we’ve learned that collecting records and rare soundtracks is frightfully addictive, albeit a little costly at times. One harsh lesson learned is that many popular soundtracks sell out rapidly. Consequently, this leaves many of us scouring the web for that rare special edition that won’t send us bankrupt. Ah well, the girlfriend can go without a birthday present this year. Even so, the satisfaction gained by being able to cleanly listen to your favorite music tracks makes it ever the more fulfilling. So, with that, this list has been catered to those of us that consider themselves a connoisseur of the medium, while hopefully being able to add intrigue to any curious newcomers. Late Christmas present or simply treating yourself, we’ve got you sorted. After all, you wouldn’t want to be a needle stuck in a groove this year. Uncharted vinyl bundle. Image Credit: iam8bit. We start off with a series near and dear to our hearts - Uncharted. We wish that we held off picking up the Uncharted vinyl records individually, now that iam8bit is offering a collection which comprises the entire Uncharted legacy. In other words, Uncharted: The Nathan Drake Collection, Uncharted 4 Aside/Bside, and Uncharted: The Lost Legacy. You can grab the Uncharted Vinyl Bundle from iam8bit for $90 (roughly £71 or AU$125). Stardew Valley Vinyl Box Set. Image credit: Fangamer. We all know that one person whose life was consumed by Stardew Valley for a period of time (maybe it still is). Well, now you can help contribute to their farming fantasies with this exquisite new vinyl collection. Although a Stardew Valley record released previously, this particular one includes the full 77-soundtrack for the first time ever. A really cool extra feature is that all four vinyl discs have been colored to match every season. On top of this, the sleeve has all-new art-work created by Kari Fry, who was the designer behind the official guidebook. Forget whale noises, Stardew Valley’s harvest themes will help anyone relax come Christmas morning. You can pick up the Stardew Valley Complete Vinyl Soundtrack Box Set for $59 (roughly £46 or AU$82) from Fangamer. Castlevania: Symphony of the Night Original Videogame Soundtrack. Image Credit: Mondo. What can we say about Symphony of the Night that hasn’t been said prior? Not only is it one of the highest rated videogames of all time but it also contains one of the best gaming soundtracks ever composed. Partnering with Konami, Mondo has brought the Castlevania cult-hit to records. Featuring the full original mix, including the unforgettable ‘Dracula’s Castle’, these remasters come packaged with seven bonus tracks from the Sega Saturn version. There are some slick original designs used for the covers too, not to mention the choice of four different colors for the record itself. You can pick up the Castlevania: Symphony of the Night Soundtrack for $35 (roughly £27 or AU$48) from Mondo. Cuphead 4xLP Deluxe Vinyl Soundtrack. Image Credit: iam8bit. Talk about catchy tunes. If you haven’t experienced the weird and wonderful world of Cuphead, you can still appreciate the stylish mixes that Studio MDHR produced with its tribute to 1930’s cartoons. Promising a ‘thrill ride of jazz jollies and big band boisterousness’, the three-hour deluxe vinyl soundtrack will add an essence of class to any party you throw. Packaged in a sleek 30’s inspired folio design, this is something to display proudly. Above all, what I love most it that you can tell the band are just having the a wicked time jamming together. 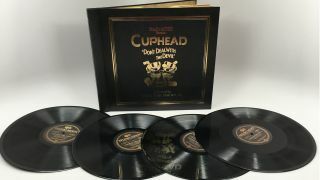 You can pick up the Cuphead 4xLP Deluxe Vinyl Soundtrack from iam8bit for $100 (roughly £79 or AU$139). God of War Soundtrack - Vinyl. Image Credit: Amazon. Anger. Rage. Fear. Emotion. God of War’s pure storytelling is simply in a league of its own. Following Kratos and Atreus on their perilous journey into the realms of Norse mythology, Bear McCreary really outdid himself with this magnificent soundtrack, that only heightens the adventure. The God of War Soundtrack is available as either a CD or Vinyl. The vinyl is available from Amazon for $41.06 (roughly £32 or AU$57), while the CD is available from Amazon for $11.65 (roughly £9 or AU$160). Hero of Time 2xLP (Music from The Legend of Zelda: Ocarina of Time). Image Credit: iam8bit. 20 years on from release, Ocarina of Time’s musical melodies are still considered synonymous with videogames. Opting for a minimal approach with the exterior art-work, inside this vinyl you’ll find stunning depictions of both time zones that Link visits in his quest. A nice added touch is the vinyl records themselves, which have been coated to represent green and purple Rupees. Koji Kondo’s triumphant orchestral was the theme music to millions of childhoods worldwide, and now sounds better than ever thanks to this newly recorded set by the 64-piece Slovak National Symphony Orchestra. You can pick up the Hero of Time 2xLP (Music from The Legend of Zelda: Ocarina of Time) from iam8bit for $40 (roughly £32 or AU$56). Celeste Vinyl Soundtrack. Image Credit: Fangamer. Scoring big at The Game Awards, Celeste left a double-prize winner after a stellar debut in early 2018. Initially selling out its original allotment, restocks are now on the way. So, if you do want the option to hear the extraordinary polyphonic tunes like never before, you’ll need to keep your eye on the prize here. The set comes with two crystal-clear records, that feature 19 tracks from the award-winning soundtrack. Don’t miss out. The Celeste Vinyl Soundtrack is available from Fangamer for $33 (roughly £26 or AU$46). Japan Studio Vinyl Bundle. Image Credit: iam8bit. Part of the same deal offered for the Uncharted bundle, the Japan Studio focused collection contains soundtracks from both The Last Guardian and Shadow of the Colossus. Anyone that has explored either title will immediately remember the epic orchestral beats that preside over each world. Takeshi Furukawa and Kow Otani’s scores have been heralded as masterpieces in sound, with many considering the latter to be timeless. You can grab the Japan Studio Vinyl Bundle from Fangamer for $52 (roughly £41 or AU$73). Doom (Original Game Soundtrack) Deluxe Double Vinyl. Image Credit: Laced Records. Hell, yes! Doom has always managed to bring the house down with its great sense of rock. Who knew shooting up demons left, right, and centre would sound so good? This collection offers the complete Doom 2016 soundtrack (31 tracks) on four black vinyl records, a deluxe double hard-slipcase, and four full printed deluxe inner spined sleeves. Interestingly, the music for this was cut at the world-famous Abbey Road Studios in London. The Doom (Original Game Soundtrack) Deluxe Double Vinyl is available from Laced Records for roughly $80 / £63 / AU$111. Golf Story Vinyl Soundtrack. Image Credit: Fangamer. Can’t get time for a round of golf? No bother, Golf Story’s superb mix of laid-back composites and energetic rifts are terrific for any day spent at home. Released for the Nintendo Switch in 2017, the indie-darling can be purchased for a subpar price. What’s ace about this product is that the record is a striking fairway green color, while arriving with 17 toe-tapping tunes to keep you happy until the Masters. A hole-in-one indeed. You can pick up the Golf Story Vinyl Soundtrack from Fangamer for $23 (roughly £18 or AU$32).